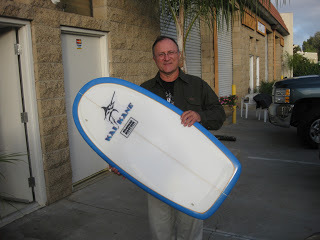 John stopped in today to pick up his new 48″ T-Belly. He likes to surf the breaks on the Channel Islands and the quad set-up will help him do just that. Fins are FCS GX (front) and smaller FCS GL (rear). This board has the standard T-Belly Bottom, with slight belly in the nose flowing into the flat mid-section with progressive single concave out the tail. Rails are soft in the nose transitioning to down hard in the last 16″. I put a bevel on the bottom out at the rail, that starts at the end of the flat section and progressively widens to about 1.5″ at the tail. The bevel serves the same purpose as “V”; increasing the rail rocker and allowing the board to more easily roll over on the rail for turning.